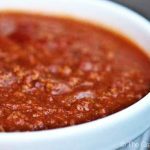 If you’ve never tried making chili with turkey instead of beef, you really should give this Clean Eating Turkey Chili recipe a try. I don’t think I could go through life without a few good bowls of chili to enjoy through the cold winter months. There’s just something about chili that is so homey, hearty and comforting. Paired with some Clean Eating Corn Bread, it’s the perfect dinner for a cold night in. This is also great for the freezer! It makes a relatively large batch, so this is really easy to freeze in portion-sized containers. It’s great for grabbing straight from the freezer and popping into your lunch bag/box and out the door you go! Pack this in a thermos for school or work lunches too. 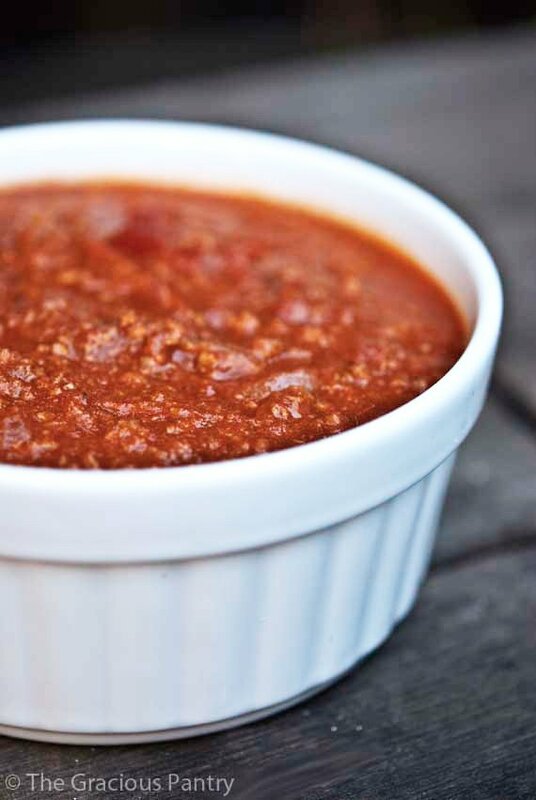 But any way you serve it, this delicious clean eating turkey chili is sure to be a hit. It’s a basic recipe I’ve been making for years and nobody ever argues when I do. It’s delicious! And for you beef lovers out there, yes, you can substitute beef here. But I promise, this is delicious using the turkey. Give it a try! Delicious on a cold night, this chili will warm up your tummy and keep you full for hours! Pair this with some clean eating corn bread or even a green salad for veggies. In a large soup pot, sauté the red onion, bell pepper and garlic cloves in the oil. Once the onions are translucent, stir in the turkey meat. Continue to stir until the meat is cooked. Stir in cumin, coriander, chili powder, garlic powder and onion powder. Add the tomatoes, tomato paste and beans. Keep at a low and steady boil for about 5-10 minutes to allow the spices to really absorb. If you find the chili is too thick, add the can of tomato sauce. Love the recipe, as always! Honey – Thanks! Hope you enjoy it! And cornbread is the perfect thing to go with it. I had the best skillet cornbread last weekend in Arizona while on vacation! Amy – You’re welcome! Hope you enjoy it! Wow. This is the first recipe I’ve tried if yours and I will definitely be trying more! This is delicious! Gretchen – Fantastic! So happy you enjoyed it! It’s great for these cold winter nights! Roseann – Fabulous! I’m so happy you enjoyed it! Natasha – Fabulous!! Those are the only nachos we eat around here! Yum! Help! My chili is too watery…what did I do wrong? I am going to let it simmer on the stove top, in hopes that it reduces down some…any advice? Katherine – Oh dear! Unless something was mis-measured, I’m not sure what could have happened. You can certainly try boiling it down a bit, but you don’t want the meat to get rubbery either. Try adding a tbsp. or cornstarch or tapioca starch. Mix it in well, and then let it chill overnight. That should help some. Let me know what happens! First comment here… but my gluten-free spidey senses were tingling. I would definitely make this. Gotta add this to the grocery list for this week, I think — been craving some chili but all the ready made chilis at the store are not GF 🙁 but this can be!!! woo, thank you so much! Serise – thanks for the comment! I think you’ll like this. It’s a staple around here during the winter, but no reason not to enjoy it during the summer too! I am making this tonight for our dinner! Also going to make stuffed sweet potatoes to go along side (a recipe from Oxygen)! Cannot wait to have this yummy meal!! GroffsGirl – That’s awesome!!! Let me know how you like it! Dnl – You can certainly brown the meat. I break my meat up in the last hour of cooking, so it’s never an issue. I just never take the time to do that. But definitely an option! JenGalietti – I’m so happy you enjoyed it! I made this for my family last night and it was cantstopshovelingitintomymouth YUMMM! Sherrette – LOL!!!! Love that! Glad you all enjoyed it so much! Not sure what you mean. I just freeze the leftovers. Definitely not enough beans for me in this recipe. Would have to amp those up a few cans. Depends on how much you brown it. You can check it after 4-5 hours to see how it’s progressing. Yup! But feel free to use less and add to taste. Enjoy! Amazing recipe and so quick and easy to make. Its been quite cold here in DC with all the snow and wind so I made this for dinner tonight. I put a bit of cheddar cheese, sour cream and a few slices of avocado on it too. It was incredibly delicious. Thanks for keeping the great recipes coming. I LOVE your website. While waiting for the blizzard to come I decided to try your Turkey Chili recipe. I made one change; I replaced the cup of water with a cup of beer. I just had some for lunch and it was delicious. Thank you for all your great recipes. I can’t wait to come in after shoveling and sit by the fire with a bowl of Turkey Chili. Quick question, I was under the assumption that bouillon cubes were not clean. When I read the ingredients they sure don’t look clean neither. Which kind are you using? Thanks! I use the Rapunzel brand that I get at Whole Foods. You can also find it on Amazon. What is the best way to freeze this? In what sort of container? And what is the best way to thaw? I freeze in plastic containers with lids and defrost for a full day in the fridge. Just made this recipe, and it was delicious! Didn’t have any chili powder, still turned out great. Added 2 teaspoons of both coriander and cumin powder, added even more flavor! Saving this as my go to chili recipe. Can this be made in crock pot! Carol – I believe so, but you will still want to do steps 1 and 2. You at least need to brown the meat if you don’t cook it all the way. If you brown it, cook for 4-6 hours. If you cook it completely first, 3-4 hours should be fine. A lot of the ingredients you name in your recipes are often called different things to us Australians! I have to really hunt for things that I can’t find in our supermarkets and when I ask staff for something they just look at me weird. I had 3 staff members hunting all over the place for kefir one day! One of them was saying I think it’s coffee and I’m like…. I don’t think it’s coffee… :/ Tomato sauce to us is sort of like your ketchup, we would use it on things like chips… well fries or… hot dogs etc. So when you say tomato sauce do you mean like, tomato juice or puree? Or do mean… tomato sauce? I went looking for tins of tomato sauce and couldn’t find them and thought maybe it’s something different to us. It’s driving me mental, I want to eat these yummy things! Pinto beans was my most recent what do we call them. Mexe-beans… we call them mexe beans! Wtf, why can’t they just be called what they are! Lol. Renee – Oh no!!! I have to say that being in Ireland right now, I have a good idea of what you mean. Tomato sauce to us is like a slightly thickened marinara with no added flavorings. I haven’t found it here in Ireland either. I ended up buying pasta sauce. Kefir is a soured milk, and is often found in nordic countries like Germany. I honestly don’t know what you would call it, but I suppose you could get close by mixing milk with plain yogurt until you have a thick but runny “sauce”. Any suggestions for a paleo substitution for the kidney beans? I can bump up the amount of peppers, but I think it would still need something more. Curious: I’ve read the instructions and I’m not sure how long this will take. Should this cook for a few hours? I saw the crock pot but the recipe leads me to believe that once you brown meat and veggies and heat through, that’s all. Huh? Veronica – Are you sure you have the right recipe? This is not for the slow cooker. This is a stove top recipe and the time is in the instructions. Delicious! I’ve been making this chili for over a year now and my whole family loves it! Thank you! Have found my new favourite website thanks for all of the great recipes can’t wait to start trying them out! Is it really 4 TABLESPOONS of cumin? I only had 2 1/2 and feel like its overpowering. Morgan – That’s what I used, but you don’t have to use that much if you feel it will be too much. I love cumin, so I tend to use a lot of it. When do I add in the beans? Do you know how many days this will last in the fridge? I want to make a pot for the boyfriend to eat while I’m gone for a week. Monica – If it’s stored below 41 degrees in the fridge, it can last up to 7 days. That being said, you should also go by smell and other signs of aging towards the end of that week. If you are worried, simply portion it out and freeze a few for the latter part of the week. It’s definitely good for 3-4 days. How do I freeze this? Do I cook everything ahead of time and then freeze in containers? Weather is getting ready for CHILI !!!! Can’t wait…. My recipe is much like yours,,,but I was raised on beef chili with NO beans.. LOL I have learned to use turkey/chicken, however, beans have a bad effect on us so I delete them. I saw a recipe for a broccoli cream soup that used a pureed cup of white beans for the cream. Does anyone know if that takes away the gaseous effect of the beans? Don’t mean to be asking such a question but I have to try to get in as much protein into out diet as possible.. Thank you all for listening and your time. My first comment – I’m LOVING all your recipes! I started eating clean at the end of September and I feel amazing. Never going back! Anyway, do you think it would work to use vegetable broth (1 cup) in place of the water & bouillon cube? Thanks!! Do you happen to have the nutritional value s for this recipe?